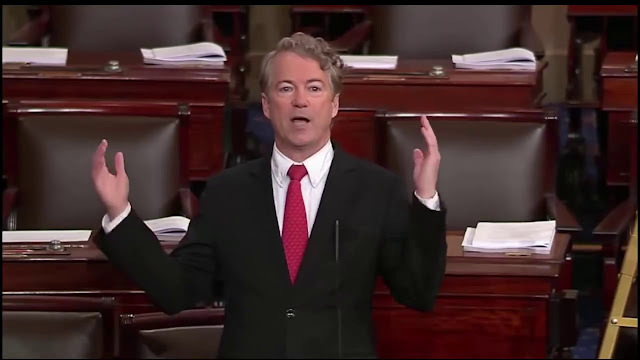 Target Liberty: WOW Rand Paul on the Senate Floor: "Trump derangement syndrome has officially come to the Senate"
WOW Rand Paul on the Senate Floor: "Trump derangement syndrome has officially come to the Senate"
I’m starting to think Paul will be Trump’s VP choice for 2020. Their tones are heated. I can’t think of a better person to object to in the Senate — just Wow! Bernie Sanders, of all people. What a sack of doodoo. Rand should not accept any offer to be trumps co. It would poison his chances with far too many people. He is more valuable as a sober voice in the Senate who triangulate between Trump and the dems. Rand speaks out against Trumps nonsense often enough to put the leftist vote in play if he were to run for prez. There's a big difference between Reagan and Trump. Unlike with Trump, Reagan never gave reason to believe he was compromised or was motivated by personal profit. Trump has had and still has business dealings in Russia and elsewhere abroad, usually involving authoritarian states, with much about these dealings kept secret. In particular, 9 years ago no bank in the US would loan Trump any money, suddenly he becomes cash rich. This wasn’t the case with Reagan, or any previous President. Reagan wasn’t a routine and pathological liar, Trump is. Reagan hadn't visited Russia before his first meeting with Gorbachev. Trump has visited Russia and told lies about it. The Democrats controlled the House of Representatives and were a check on Reagan’s power. Today it’s controlled by the Republicans and protects Trump. Trump has well-earned distrust in him. All good politicians know how to pull the wool over the people. Reagan was an actor. He knew how to play the public. He sold GE to the public for years and made a ton money. So what. He was polished while Trump is coarse. He had his albatross, the Iran-Contra Affair. So I don't see that your argument negates Rand's statement. @Jack, are saying that at over seventy years of age, having left an extremely comfortable life and career, where he waa respected by many Trump ran for President so he could make more money? @Robert What?, He didn't necessarily expect to win. But in any case, he absolutely wants to make as much money as he can, both he and his kids. That's who he has always been. You sure about your recollection of Reagan, Jack? I'm old enough to remember him as President and as Governor and I don't recall him as saintly and beyond reproach as you. Perhaps reading some things not written by court historians and gate-keepers will refresh your memory? Even more reason for peace if Russia is his cash cow, at least two more years without nuclear war. I'll take that trade. @Unknown, Quite sure, and I’m old enough to remember as well. Reagan put his estate in a blind trust for his Presidency and released his tax returns, as was the norm at the time, and have been the norm ever since through Obama’s Presidency. Trump hasn’t done the former or anything close to it, and hasn’t released his tax returns: full transparency with Reagan, none with Trump. And as I pointed out before, Reagan didn’t have foreign business dealings, unlike Trump. Reagan wasn’t a philanderer or habitual adultery. There was no concern a video of him with a female could be used to compromise him, as is the case with Trump. If you were around then, you know Reagan never shrunk in size or sounded weak in the presence of any head of state, or anyone. Trump did shrink in size in his press conference with Putin, and sounded weak at times. You are a typical member of the cult of Reagan. All the "tells" are in your comments so, I know that no matter how much information I put out there showing that Reagan was not the squeaky clean altar boy you cult members portray him to be, you will find a way to rationalize and justify his actions. No worries, I get it. Hell, I voted for him once. As far as your comments re: Trump v Reagan go, all you are really doing are stating your preferences. So what. And btw, I don't vote and I am not a Trump supporter either, but, I find his ability to induce apoplexy and in people fascinating. Apparently this “Reagan cultist” voted for Reagan as many times as you did, and did so when he was young and naïve in 1980, and hasn’t voted for President since. I was off the conservative reservation after his first of many tax increases. You’re believing what you want to believe. I do respect Reagan as a man and person in a way I don’t respect Trump, in both the way he obtained his wealth and how he treated other people personally. and Reagan's character and involvement within the Iran-Contra scandal, his taking advantage of the hostage situation in Iran for his personal advantage, the Falkland debacle, etc., etc., are ok by you, just don't cheat on your wife and be a great actor when your lying. Got it! "You can't refute the facts..."
I don't have to. Rothbard wiped the floor with him. Peter Dale Scott and a few select others have done admirable jobs of separating out fact from fantasy also. Reagan was just as big, (if not a bigger! ), liar than Trump. It's part of the job. He just didn't have that brash cockiness like Trump so, it could easily fool and disarm a person because it lends to his likeability factor. I have no doubt he had some wonderful qualities as a human being, but, I don't believe history and the facts bear out the things you believe they do. Why is Bernie so upset that (as he believes) the Russian government disclosed the DNC emails showing that he was shut out from the primary? Maybe he's embarrassed that he was so easily played? I think Bernie is just pissed at all ex or present commie governments for not being able to back his philosophy as a good. Bernie got paid, not played. His naive or worse supporters got played.